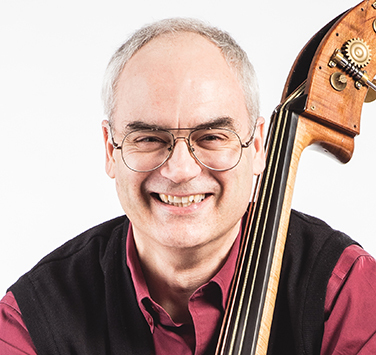 Principal Bassist of Symphony Nova Scotia since 1986, Max Kasper has gained quite a following over the past 20 years for the public education concerts/lectures he organizes and hosts at the Halifax Public Library. Max has appeared as a soloist with the orchestra on several occasions, and given many solo bass recitals over the years. He also loves playing chamber music, and has formed the Gatto Dolce Duo with cellist Colin Matthews. They released their first CD, Duets for Cello and Bass, in the spring of 2008, and are slowly working on the next one. Max has a keen interest in period music; he plays in Halifax with Réjouissance and Tempest baroque ensembles, and plays as an extra with Tafelmusik on occasion. Now pursuing a second career as a bow maker, Max has the unique distinction of playing on a bass and bows he has made himself. He lives in Halifax with his love, Esther Ricketts, and their three cats: Xena, Murray, and Finnegan. In his spare time he likes to watch TV, read, sleep, and feed the cats.